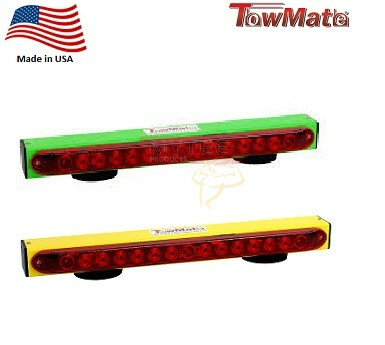 The TowMate Tow Light comes in the popular Lime Green and Sunlight Yellow Colors. It is a popular tow light which works wirelessly, provides stop, tail and turn signals. It is 22 inches wide and contains 14 LEDs. 7-Pin truck, 7-Pin RV, 6-Pin round, 4-Pin flat, and hardwire transmitters are also available at an additional cost.